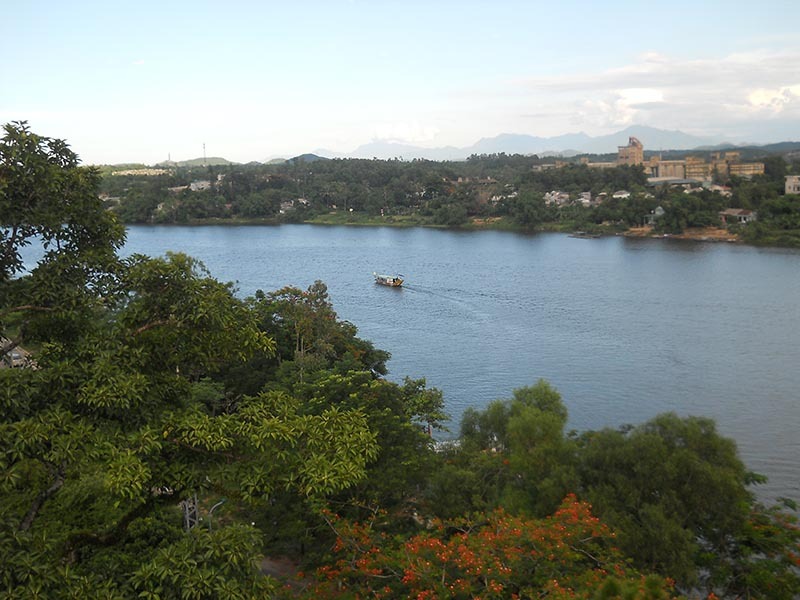 Hue City has always been a romantic destination for most of the tourists thanks to its tranquility and peaceful beauty. Once visiting Hue, if you don’t pass through the pagodas or temples or tombs, then it seems like you have never come to Hue. So why not try? 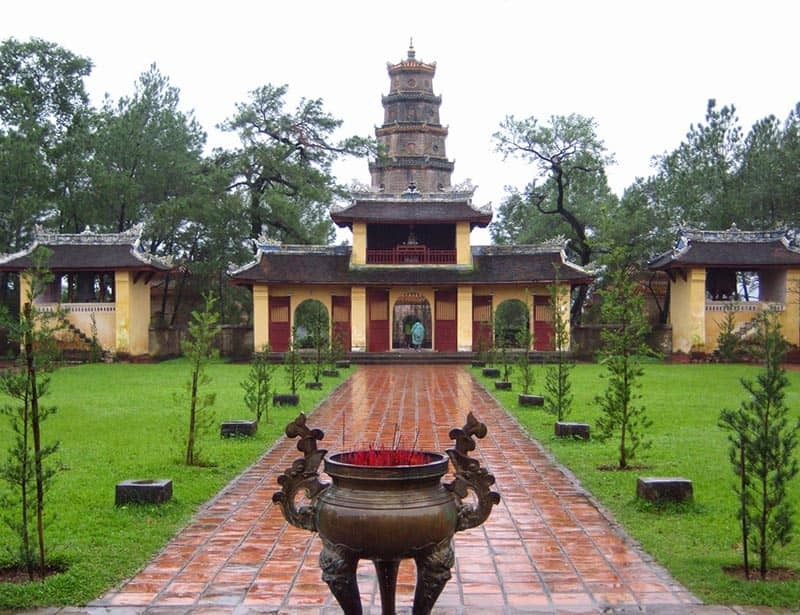 Let’s start to explore Thien Mu Pagoda, one of the most famous places in Hue. Thien Mu pagoda is located at the end of Kim Long Road, in Huong Long Ward, on the northern bank of the Perfume River. 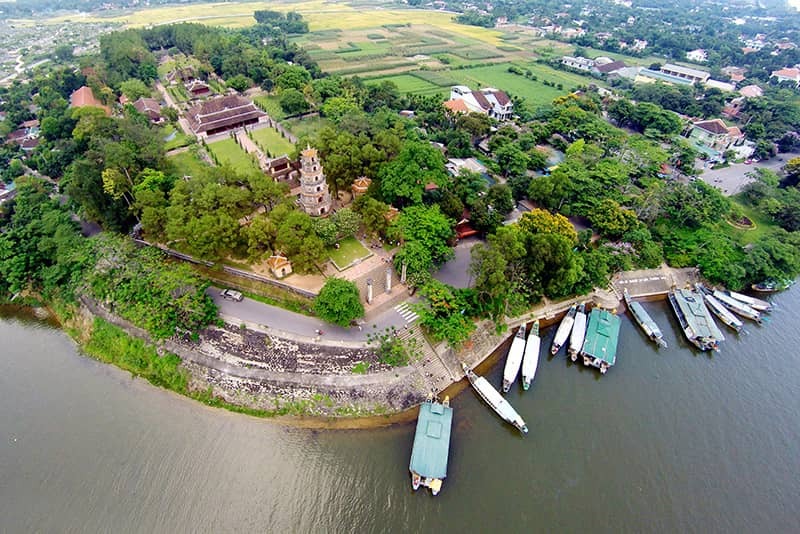 Since it’s about 4 km from Hue City center, you can get here by motorbike, by bike or by boat. However, we would highly recommend you to choose a biking trip to enjoy the scenic and quiet roads in Hue. A boat trip, on the other hand, can included visiting Hon Chen Temple and Minh Mang Tomb which are two others appealing attraction. Once standing in front of the main entrance of Thien Mu pagoda, you would be blown away by the seven-storey octagonal tower named Phuoc Duyen Tower. Tracing back to the mid-19th century when King Thieu Tri still held the power, this tower was built to commemorate the 80th birthday anniversary of his grandmother who is the mother of King Gia Long. After passing the 3-door gate and 12 huge wooden sculptures of fearsome temple guardians, you are in Dai Hung Palace, the main sanctuary of Thien Mu Pagoda. Fragrant incense smoke fulfills the air there from day to night, which makes the praying for blessings calm and peaceful than ever! At Dai Long Palace, Buddha is worshiped with impressive sculptures and a giant bell with 2.5m high and 2 tons heavy. You can have a look at the car in a building near the rear of the complex houses. That’s which carried the monk Thich Quang Duc to the intersection of Phan Dinh Phung and Le Van Duyet streets in Saigon on June 11th 1963, where he burned himself and sacrificed with the intention of opposing the anti-religion policy of Saigon’s regime at that time. The car is now still preserved and protected carefully. If you have ever come to Thien Mu Pagoda, you won’t forget the charming attractive landscape there and have to take some photos to memorize that moment. Thanks to its high position upward an amazing curve of Perfume River and the cover of pine trees, bonsai and delicate man-made pond, this religious site brings about a one-of-a-kind glamorous and brilliant sightseeing. Let’s take a trip to this gorgeous pagoda and enjoy a relaxing moment that can rarely find anywhere else, but Hue, and Thien Mu Pagoda. Thien Mu pagoda opens daily from the early morning till 5PM with no entrance fee. As a suggestion, you should come here early in the morning to feel the fresh air of the beginning of daily life in the pagoda, or reach here at sunset when the sky and the river combines to create a picturesque scene that you can hardly find anywhere in Vietnam. One more thing you should notice is that Thien Mu Pagoda is usually crowded on some special occasions such as 15th of April and July of Lunar Calendar or at Tet Holiday because here the pagoda has several unique ceremonies that you may find interested. What’s more, there are the time when visitors can have the most traditional and delicious vegetarian food in the city freely. Due to the fact that we are coming to visit a beautiful and gorgeous view in a pagoda, you need to wear polite and formal clothes. Thus, tight and short clothes like short skirts are not allowed to enter the pagodas. It’s essential to keep the peaceful atmosphere there without making so much noises and jokes.